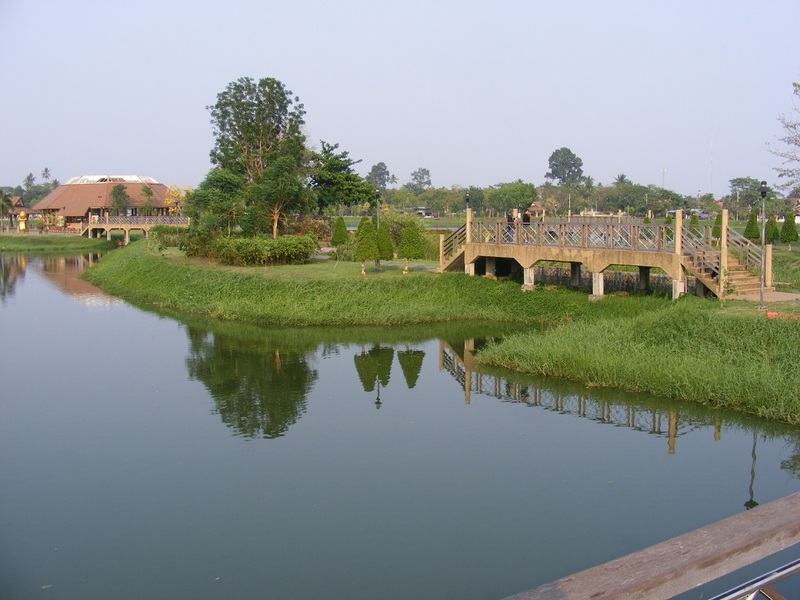 Nong Bua Park, also known as Chaloem Prakiat Park, is one of three reservoirs in Udon Thani that have been developed to create a recreational centre for the city, (the others are at Nong Prajak Park and Nong Sim Park) a place where you can walk and exercise - but cannot cycle around, or go fishing. On the eastern bank, there is a paddle boat hire, though the prices for hiring these is not clear, though unlikely to cost a great deal. 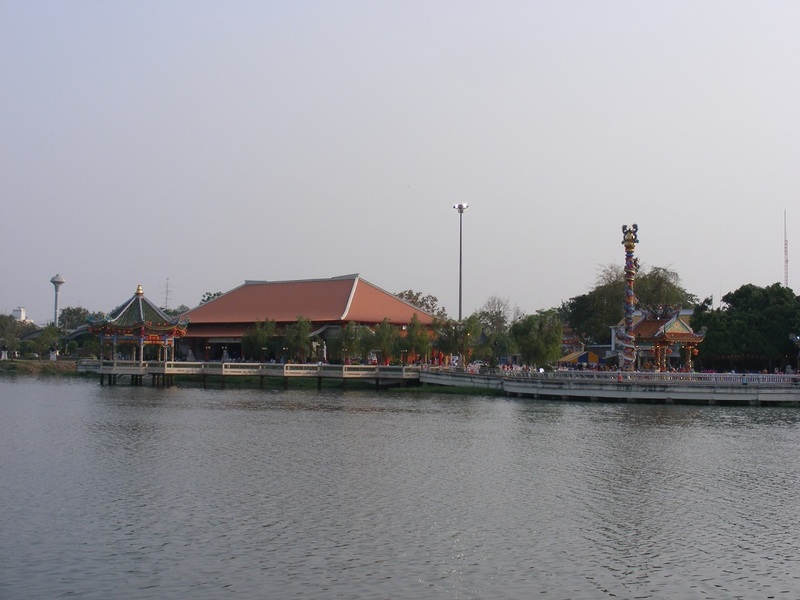 The Loy Krathong festival also takes place here in November. 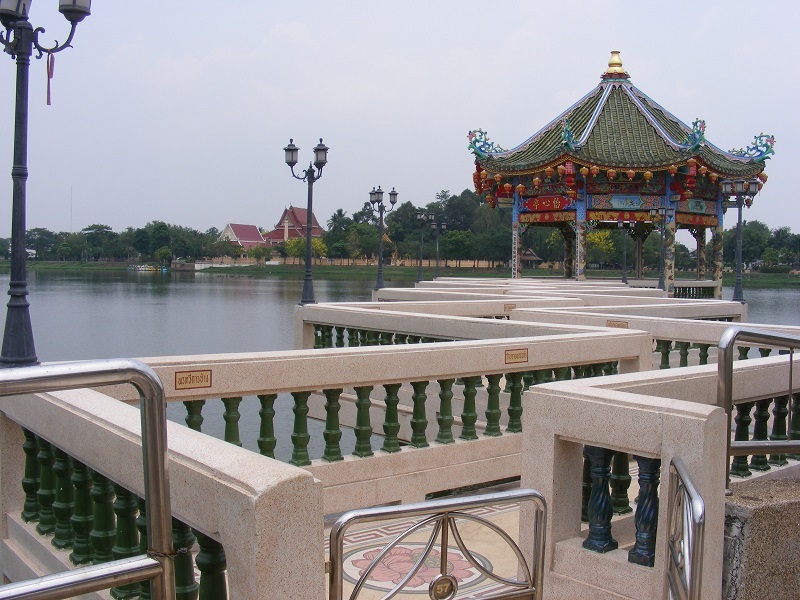 Nong Bua Park is a 'Chinese' version of Nong Sim Park, being quite open, a full surrounding circular walkway, and not much else except the view and a number of highly colourful and splendid temples and well manicured gardens. 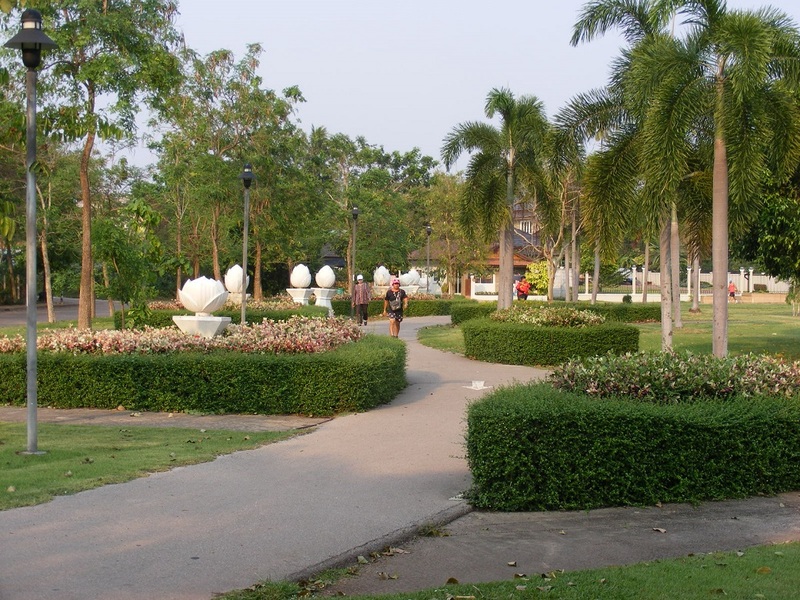 As with the other parks in Udon Thani, it is largely void of people during the day as the sun is too intense, so from about 4.30pm people start to arrive for their evening stroll. There are a couple of small islands connected by bridges to walk across to get a slightly different view of the lake. 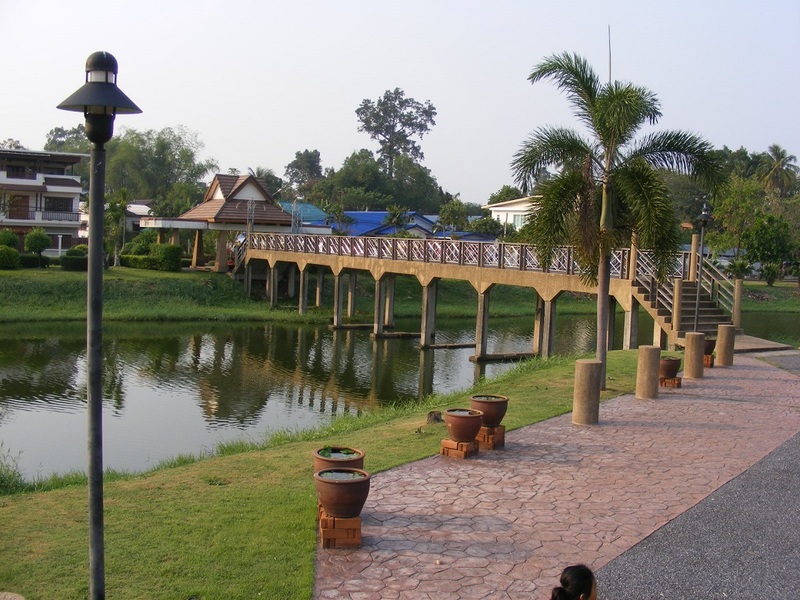 Unlike Nong Prajak Park, there are no fish food sellers but there are, of course, food stalls present. There is a restaurant on site too, adjacent to the temples and on the south bank of the lake. It is arguably the prettiest of the three reservoirs/lakes, but perhaps not the best for walking unless you want the added challenge of a number of bridges that have sets of steps leading to and from them. 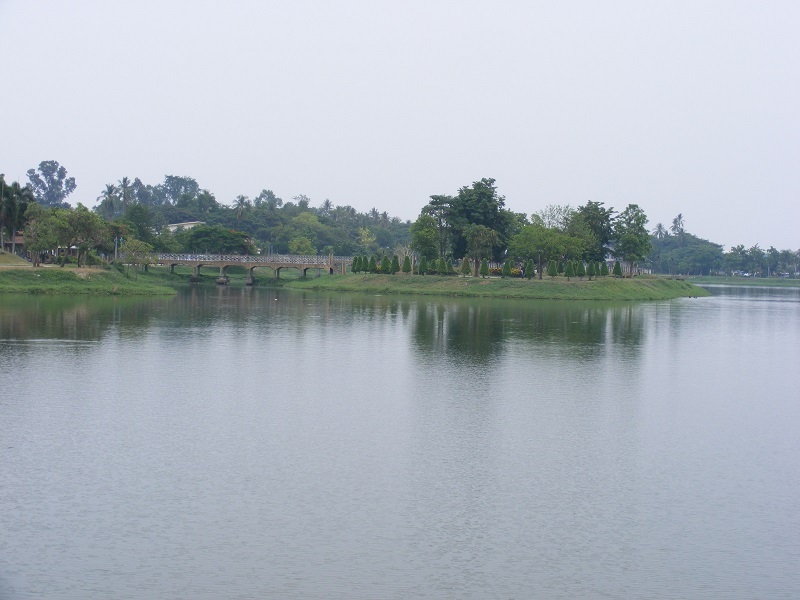 The west bank has the most features and all of the bridges which lead to islands, which also have at least one feature present for added interest. 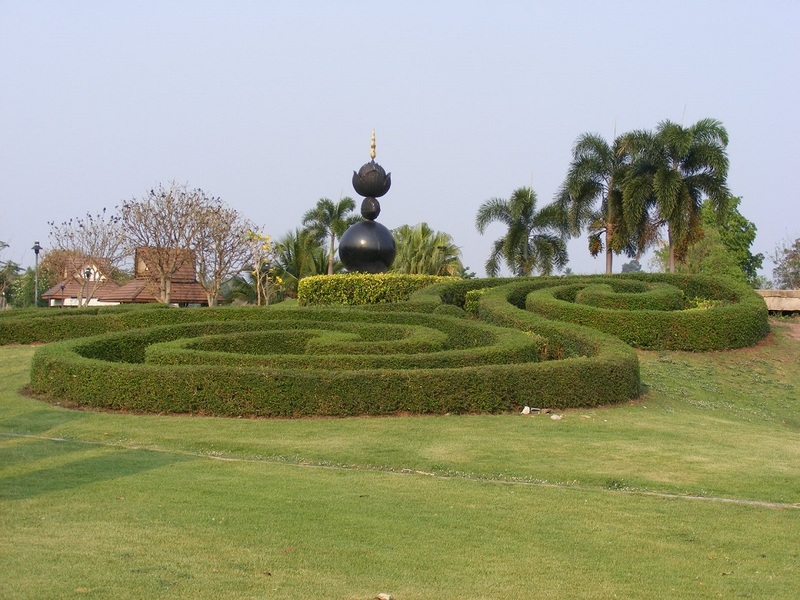 You will find shrubs that have a maze look about them although they are not a maze at all. There are lots of 'box' hedges that are well trimmed with shrubs placed inside for a lovely contrast in colour and enhanced appearance. 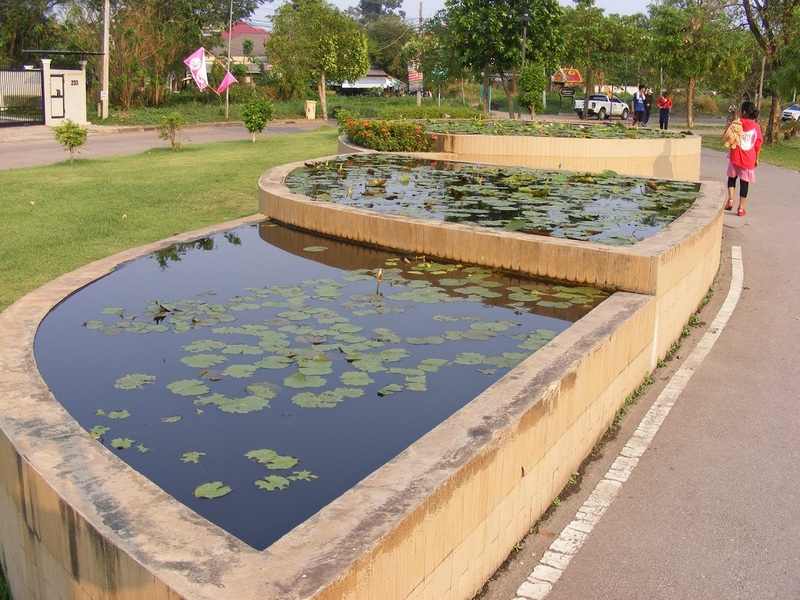 There are two sets of five fish ponds, one set at the north and the other on the east bank. There are only a few Guppies living in the ponds but when the lilies are in full bloom they look really nice. 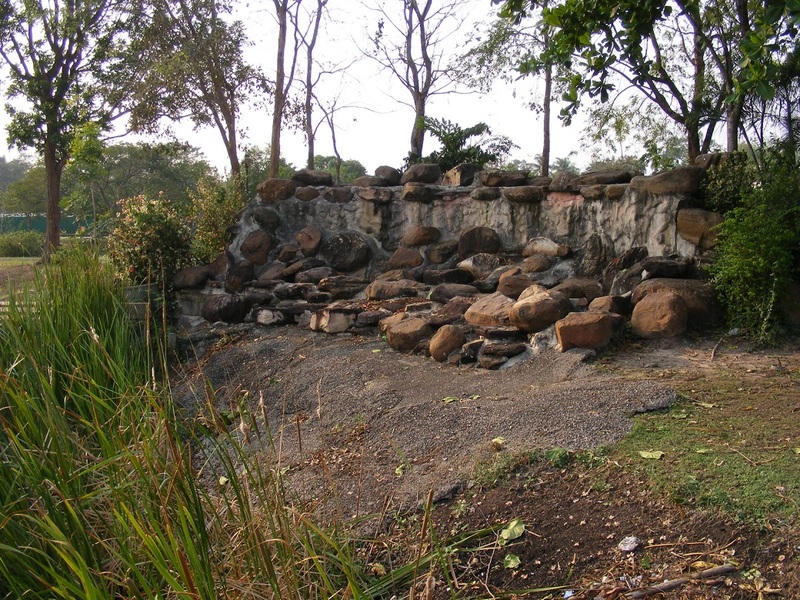 One of the most curious features on one of the islands is what appears to be a giant rockery, but without any plant life. On second thoughts, it may be representing a waterfall, only without the water, or at least I have never seen any water spilling over it in the times I have visited. It is perhaps not fabulously beautiful but it does catch the eye, and looks reasonably natural. There seem to be very few fish in the lake so don't expect to see many, although you probably will see the odd fish rising coming to the surface. 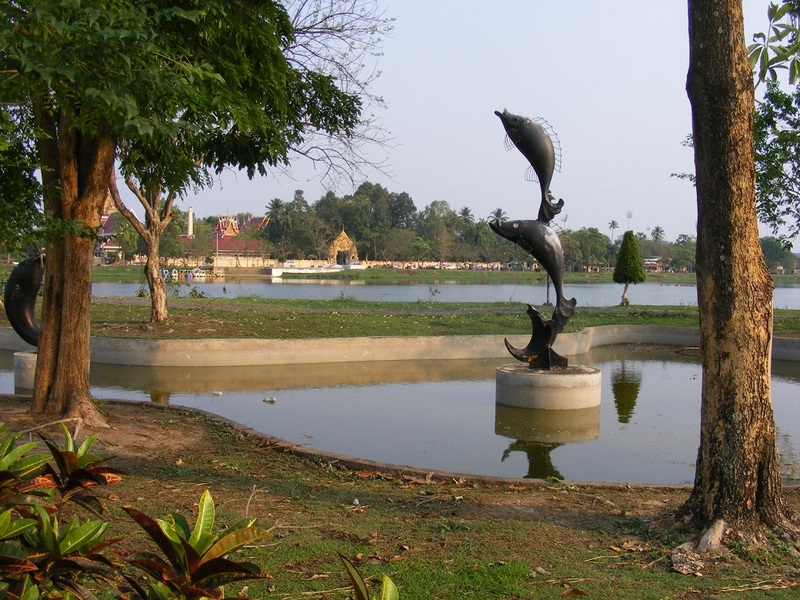 On the east side of the lake is a car park, which is partially filled up with the food sellers but you will only find Thai food on offer and room to sit on the floor only to eat. This does prove quite popular with the locals though and many people only pull in to buy food and go off home. You will see a few people sitting on the floor enjoying a meal but most customers, from what I have seen, don't. 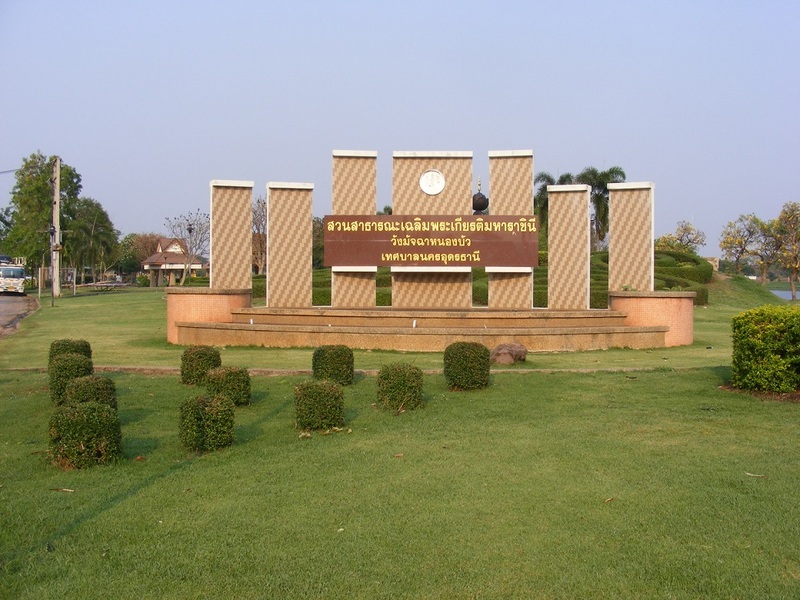 Nong Bua Park is the closest park to the 'ferang' area of the city, located on the other side of the railway line that splits the eastern part of the city from the rest. 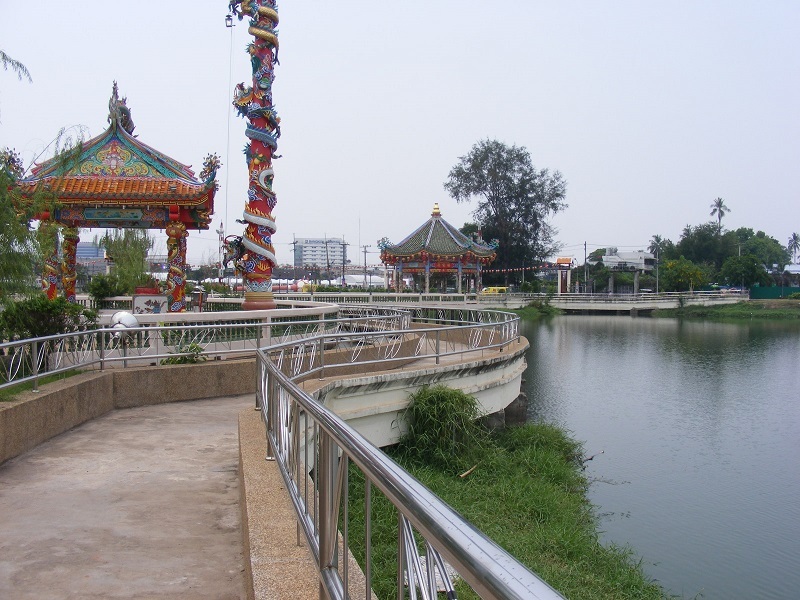 Access is by the Pho Si Road, which goes south east to Makro and Big C. McDonalds, Pizza Company and two Sushi Bar restaurants are also very close by. From the Night Market (facing the railway station), turn right on to Tong Yai and go all the way to the junction with Pho Si Road, then turn left again. Cross the railway and take either the 1st, 3rd or 5th road on the left to access the park. Taking the 3rd turning is the best as it takes you through a series of Chinese temples en route to the lake.